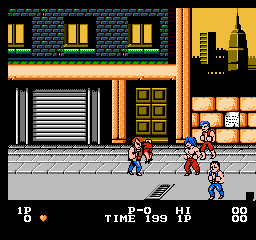 Double Dragon for the Nintendo NES is a port of the arcade game of the same name. Since it was a port going from the arcade to the NES some of the game content had to be dropped due to the limitations of the NES. 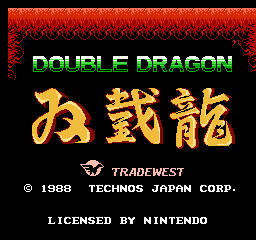 One of the things that was dropped in the arcade to NES port unfortunately was 2 player simultaneous play during the normal game mode. Instead a 2 player versus mode was included but it wasn’t as good as the regular 2 player cooperative mode could’ve been. The gameplay was still as fun and fast paced and depending on who you talked to it was more fun than the arcade game. The story is that your girlfriend has been kidnapped and you need to save her. The gameplay is pretty balanced and has a nice experience system where you get points based on the kind of attacks you use on your enemies. Every time you gain 1000 experience points you get a heart which is equivalent to “leveling up”. Each heart designates a new move added to your character’s arsenal. 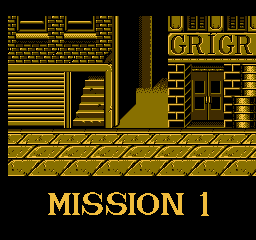 The graphics are colorful and detailed for a fairly early NES game. The play control is tight and responsive and each move is easy to pull off. The sounds effects and the music are also well done with some of the stage’s tracks being memorable. This game is pretty challenging but most players will be able to finish the game with enough practice. This isn’t an expensive game for collectors and it should be in your retro game collection if you want one of the best NES beat em up games.